Wow, this is one weird book. If you took one part pulp, one part Saturday morning cartoon, and one part Indiana Jones and threw it all in a blender, you’d end up with Archer and Armstrong. Following a giant of a man – who just so happens to be immortal – and a teen martial arts expert, the story can only be described as a “wacky adventure”, but Roberts manages to bring the different genres and elements together to create an engrossing modern day pulp adventure book. When reading it, I couldn’t help but hear old-timey voices in my head, like one of those old radio plays, and that certainly wasn’t a bad thing. In actual fact it helped create this wonderful sense of nostalgia, which meshed perfectly with the book’s modern day setting, to create something fresh, but reassuringly familiar in the process. I mean who doesn’t want to know which wombat is the father?! Reality TV is the real devil here! 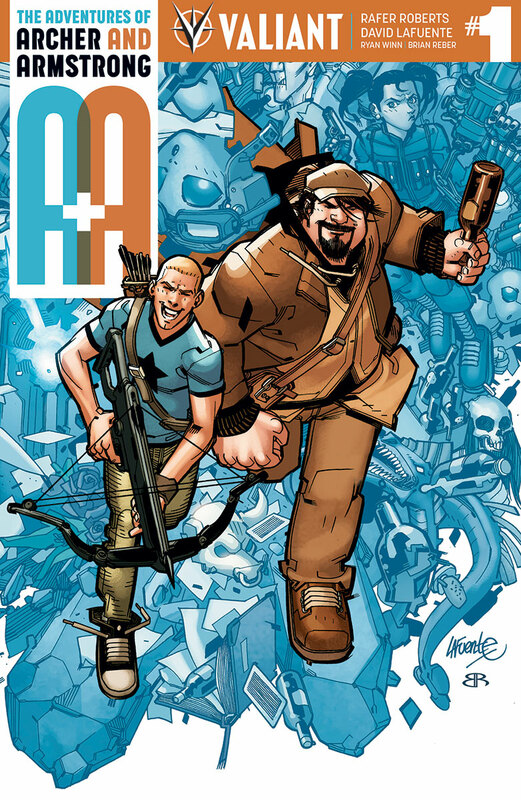 Lafuente’s art style is super-clean, almost to the point of being European in style, with over exaggerated characters and bold, open backgrounds. The use of off-centre panels and disjointed page structures give the book a strangely intriguing flow, which although challenging, is definitely very effective. While occasionally the book can appear to have a little too much style and not quite enough substance, in fairness it doesn’t take itself too seriously and it did genuinely made me laugh. Furthermore, it requires no background reading to enjoy fully, so new readers can jump right in and enjoy the action, but you can bet I’ll be looking to absorb everything I can about Archer and Armstrong from here on in.